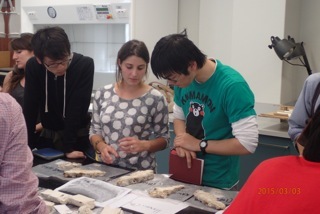 Last Tues we were lucky enough to host a group from the University of Tokyo for a 1 day coral reef studies workshop. This part of a strong and ongoing relationship the GRG has developed with Professor Yusuke Yokoyama at the Atmosphere and Ocean Research Institute, University of Tokyo. Yusuke leads one of the largest and more dynamic geochemistry/geochronology groups in Japan and visited with a group of about 20 undergraduate and postgraduate students. 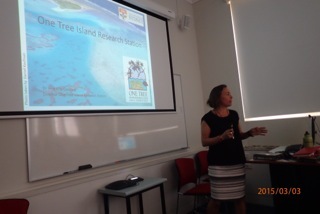 It was a great day with short seminars highlighting some of the GRG’s exciting reef-related research (thanks Steph, Ana, Bel, Kelsey and Madi) along with presentationsfrom Yusuke and myself. 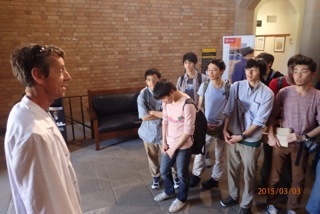 The Japanese students were then given a tour of the main USYD attractions, include the School of Geosciences shiny new ICP-MS (thanks to Tom Savage)! We then spent the afternoon logging fossil reef cores in the Sed Lab that have been collected from all parts of the Indo-Pacific (e.g., GBR, French Polynesia and Hawaii). And finally, we discussed the finer points of coral taxonomy over a few beers at Herman’s. All in all a fun day and thanks again to all those that participated.